Pudhu Pudhu Arthangal Suresh is on the breakfast table. He says that it is very difficult to have a meeting with Meena and it is good that Sharadha is not meeting her. Sharadha comes there wearinf a beautiful saree, but suresh got angry. Her daughter also started threatening her for meeting Meena. She says that Meena is a very big business and she gets emotional very easily and scolds everyone without any reason. Suresh asks Sharadha if she really wants to meet Meena. She says yes. Then he told her that she should be dressed in a proper way. Karthik and Sakshi congratulates her and happy for Sharadha. Sharadha went to change her dress and Sakshi followed her and says that the saree she is wearing was beautiful. Sharadha tells Sakshi that she knows her plan for making her to go alone to meet Meena. Sharadha took some saree designs and leaves her home. Sharadha is travelling in her car, while going she practices herself to talk to Meena. She got an idea to talk to Sakshi to get some idea on how to behave in front of Meena. 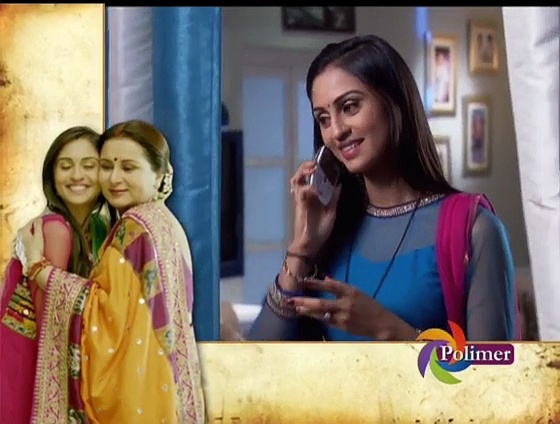 Sakshi encourages her to talk to Meena boldly. Sharadha came to Meena’s office and she was standing in the reception to meet Meena. That time Meena herself came there and talk to Sharadha and took her to the cabin where she sits. Sharadha was surprised to see her. She greets her. Meena wants her to show the saree designs. She was impressed and she gave an order for her daughter’s wedding. Sharadha was so happy and she couldn’t tell the price for the wedding saree. So Meena gave her the blank cheque to her and asks her to fill the amount once the amount is finalized. Suresh is in his business meeting and thinks about Sharadha. His daughter also thinks how her mother would have got insulted in front of others. Suresh came home with her daughter. Granny told them that sharadha didn’t reach home still and she is also worried about sharadha. She asks to Karthik and Sakshi about Sharadha. Sharadha comes home that time. Sakshi welcomes her. Sharadha comes home telling that she got stuck in traffic and so she is late. Suresh interrupts her and asks her whether she got insulted by Meena. Sharadha says happily that she got an order. She says that Meena is happy with her designs and placed an order to make Meena’s daughter wedding saree. Suresh asked her how much did she paid for this? Sharadha gave the cheque to them. Her daughter was shocked to see the blank cheque and Karthik says that Meena would have liked her Saree designs and she is ready to pay any amount for that. Karthik and Sakshi hugs sharadha and congratulates her. Suresh called his children for a meeting and they left the place. Sharadha happily touches granny’s feet and took her blessings. Granny told that after she gets the amount from Meena she should give her treat.